Goodbye honeymoon bliss, hello stark reality. Following 12 days of carefree honeymooning Spain where everyday was an culinary adventure, the first thing we craved after a grueling trans-Atlantic and cross country flight back to Los Angeles was something homey, simple, and soupy. We expected a warmer welcome, but was greeted with cold, heavy rain, and even hail upon our return. To top it off, we were both feeling a bit under the weather so a therapeutic and comforting bowl of cháo (rice porridge or congee) was the first thing we made as soon as the jetlag wore off. There are many different versions of cháo, but the most common are cháo gà (chicken), cháo lòng (pig offal/innards), and cháo cá (fish). Just as there are many varieties, there are just as many ways to make cháo. Some make a plan plain thick bland porridge and then add different types of broth and toppings. We present a very traditional southern way of making cháo cá, made famous in the Mekong delta region, known for its abudance of fish and sea life and floating markets. You can use any type of firm white flesh fish, however the traditional fish used in the Mekong is cá lóc, the snakehead fish. 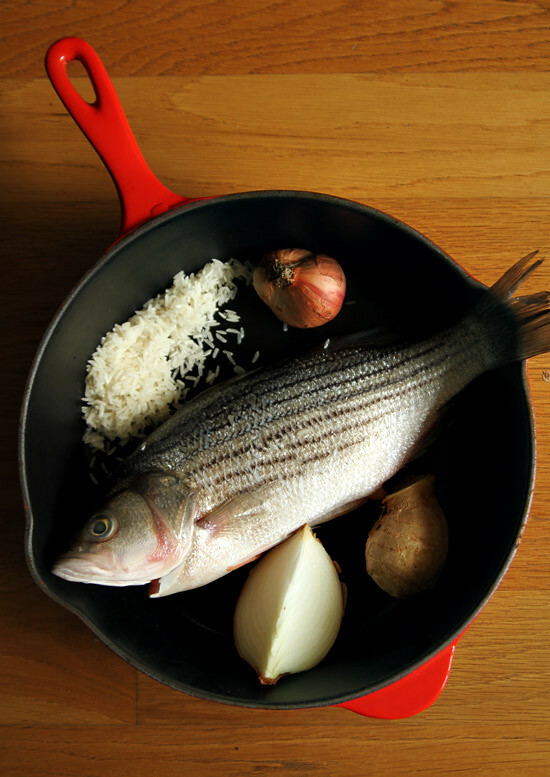 We prefer using a whole fish (we used stripe bass. 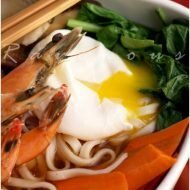 Also if you have frozen shrimp shells saved, use those too) to make stock, however fish filets are acceptable as well. 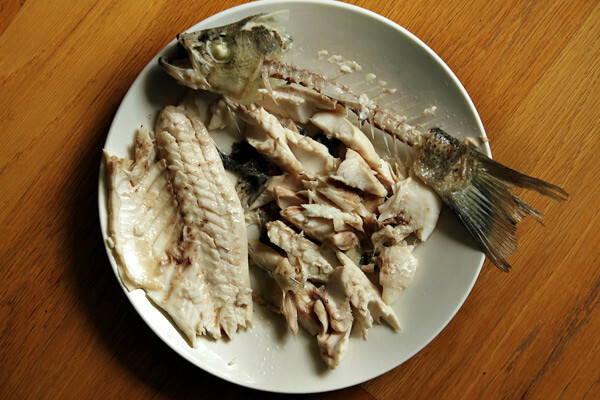 The easy way would be to cut the fish into bite size pieces and add that to the porridge to cook, however the traditional way of making fish stock and sauteeing the flesh in garlic makes for a deeper and more soulful flavor and totally worth the extra effort. 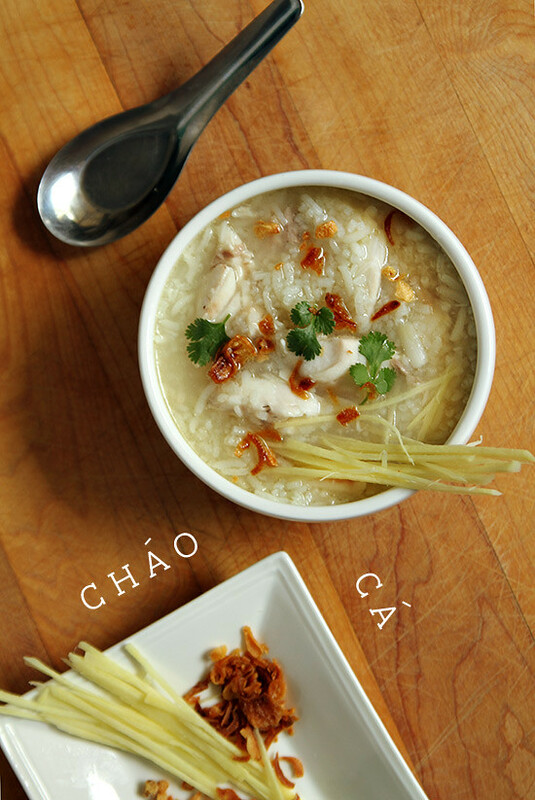 This is our entry to Delicious Vietnam a blogging event to celebrate Vietnamese cuisine. This month’s event is hosted by the lovely couple, Ginger and Scotch at the eponymous blog Ginger and Scotch. Visit their blog for the complete round up! Wash rice, drain in strainer or small holed collander, and set aside to dry. I also love a small spoon of chili garlic sauce mixed in. Ahhhh, comfort food. Your chao looks amazing!! So glad you had a great time on your honeymoon but I’m sorry you guys got sick! I would love to host a Delicious Vietnam event one month next year. Let me know! I love fish porridge or I prefer to called it “jook.” Usually your pictures makes my mouth watery but in that picture, the rice looks a bit under cooked. It needs to bloom more. Ah, nothing like a bowl of chao to make soothe away whatever ills you. Post-travel sickies is the pits. Chicken chao’s our favorite at home when we’re sick but you’ve got me interested in fish chao. I’ve always had problems with getting the right texture for it. I love the look of the fish porridge. 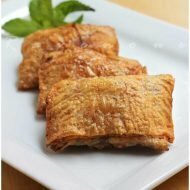 It looks so delicious and comforting, and the list of ingredients is not intimidating. I’m glad I found your blog! The photographs are excellent, and I’m inspired by what I see! Fish porridge is always my favourite comfort food! OMG Found this recipe at 5pm last nigh.. Had it on the stove at 5.30pm, or a variation because I just didn’t have all the ingredients. Scarfed it all down for dinner. Am thinking we may have it again for tonight’s dinner but maybe vary the ingredients. I only had a whole squid and a coral trout fillet in the fridge, so that is what I used. Both frozen when I started. Worked a treat! Thank you for satisfying my cravings for a good jook recipe. i’ve never had chao ca like this before. i’ve had it two ways but my fave would be plain chao and topped with day old claypot caramel fish. I had to smile when I read that you made cháo as soon as you got home. I did the same thing upon arriving home this past weekend, feeling a bit under the weather. 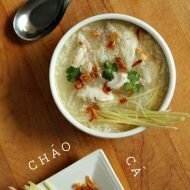 Sometimes, only a bowl of cháo will do It’s been a while since I’ve popped into your blog and I absolutely love the new look! That is such comfort food, yum! Thank you so much for this! I have been craving this super bad. Growing up my mom made this very thickly either plain or with chicken. I remember she used to soak the rice before she cooked it; I think that helped release starch and get it very soft(?). I am going to make this tonight! I really like Vietnamese usage of shallots. It gives a very different flavor than Chinese style porridge. This is definitely my comfort food (while Chao Ga is one of my hangover cures. He he). Mmmmm….do you guys fry your own shallots or buy it? 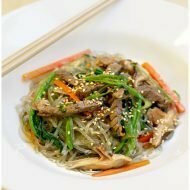 You should try this recipe with seabass! It is delicious! Coming from the East Coast originally fish soups of all kinds are a cultural culinary event. From the fish soups of New England to the Manhattan style clam chowder of New York City. I am an Asian food junkie but I must say this porridge looks delicious! A total must try for me. Thanks for sharing! I stumbled across this recipe about a year ago, & it quickly became a favourite of mine when I’m under the weather (usually with chicken though) Thank you so much!